Arun Jaitley said that 6.86 crore I-T returns have been filed in 2018, it is expected to go up to 7.6 crore before the present government completes its term. 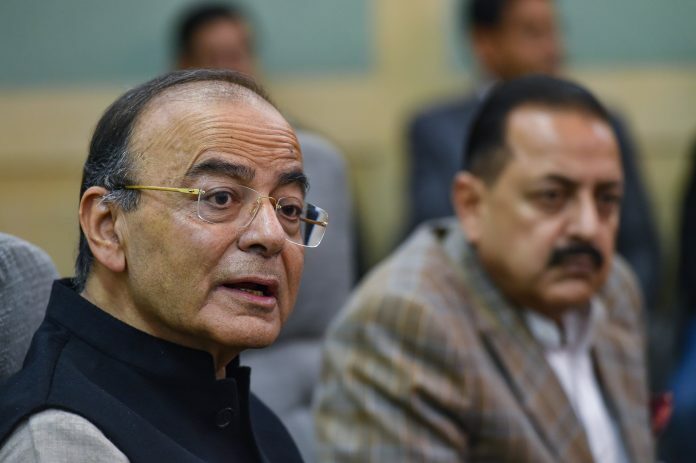 New Delhi: Finance Minister Arun Jaitley Friday said the number of income tax payers can double to almost 12 crore with increased formalisation of the economy. As many as 6.86 crore I-T returns have been filed this year and the number is expected to go up to 7.6 crore before the present government completes its five year term, he said. “3.8 crore people filed I-T returns in 2014 when the NDA government came to power. There are 25-26 crore families here. The country is capable of having a 10-11-12 crore tax payer base,” Jaitley said at the ‘Jagran Conclave’ here. India’s normal rate of growth is 7.5-8 per cent and the country will continue to grow at this rate, despite some deviation in one or two quarters, he said. “Oil prices are a drag…. India can continue to grow at the same pace for two decades, but we need mature leadership for that,” the minister said. The Indian economy grew at 6.7 per cent in 2017-18 fiscal. In the April-June and July-September quarters of the current financial year, the GDP expanded by 8.2 per cent and 7.1 per cent respectively. Jaitley said India has the capacity to grow at least 5 per cent more than the average growth rate of the rest of the world.